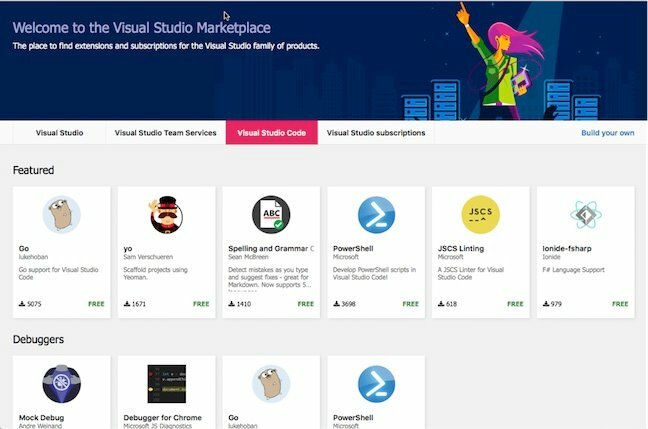 In this article I am going to use Mac OS X but you can find installation links for the other operating systems here: https://code.visualstudio.com/. 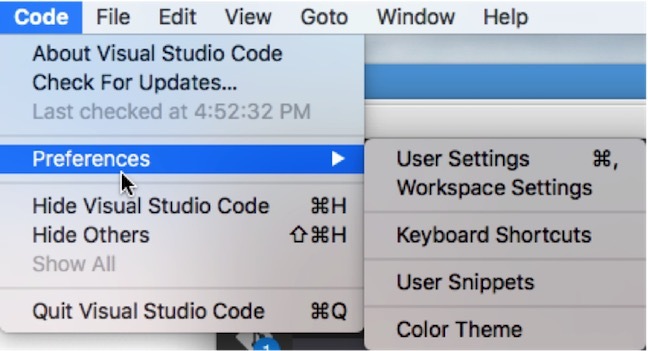 For Mac devices, the installation process is very simple: you just need to download the Visual Studio Code install package, drop it into the Application folder, and it is ready to run. Of course, geeks can visit GitHub repository to build and run VS Code directly from the source, but if you don’t plan to contribute, it is better to use a stable and ready to use installation. We will be using the Visual Studio Code beta (0.10.1) version to cover some important features, but Microsoft usually publishes public installation packages on a monthly basis, adding new features. For example, in the beta, Microsoft introduced extensibility features, GitHub source availability, and lots of small changes around debugging and languages. Visual Studio Code is a folder-based editor, so in order to open an existing project, you need to open the project’s folder. If you want to create a new project, you just need to create a folder and open it in Code. 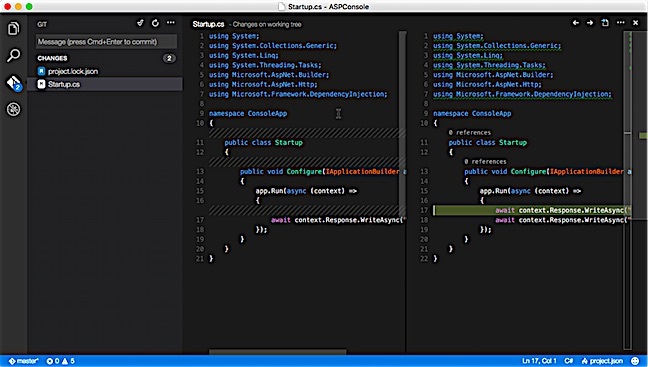 In general, when using Visual Studio Code, you will work with the following common parts of the interface: Viewbar, Sidebar, Statusbar and Editor window. The Viewbar (an interface near the left edge) allows you to switch between different views and contains information about items such as unsaved changes and commits. The Sidebar allows you to display different views like Explore, Search, Git and Debug. The most common view is Explore, which allows you to navigate between files in your folder, create new files or deleting existing ones. 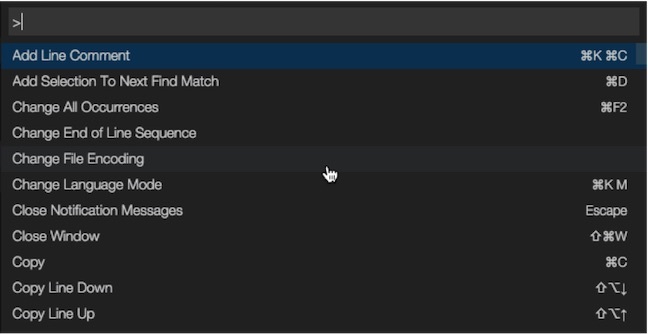 The Search view allows you to find a search term inside the folder’s files, the Git view provides some features related to Git, and Debug view provides information about breakpoints, variables and related items during debugging sessions. Finally, the Editor window allows you to edit files. You can open up to three Editor windows at the same time - just use the Sidebar to select any file and select Open to the Side context menu item to open the file in a new Editor window (pictured below). 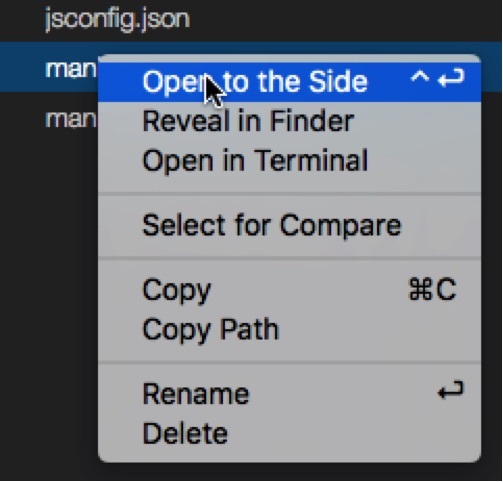 In the context menu you can find two more useful commands: Reveal in Finder and Open in Console. The first one allows you to open a folder where the selected file is located, and the second one allows you to open the console in the context of the folder. User Settings allows you to apply settings to all folders, while Workspace Settings allows you to override settings for the current workspace. In this window (Command Palette) you can see hot key combinations for future use. You can change any key combination through Preferences: Open Keyboard Shortcuts command using the Command Palette. Finally, by clicking the branch name in the status bar you can open the command line for the Git tool, where you can create a new branch or switch to an existing one. 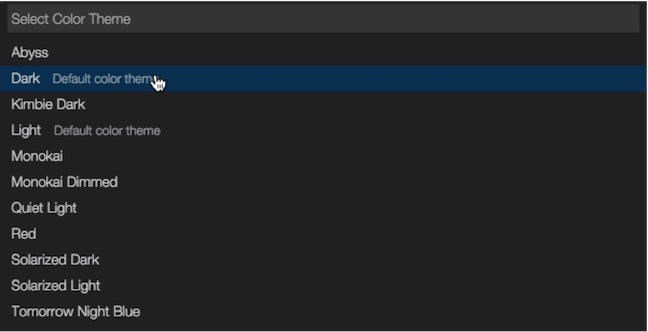 The next important feature in Visual Studio Code is tasks. 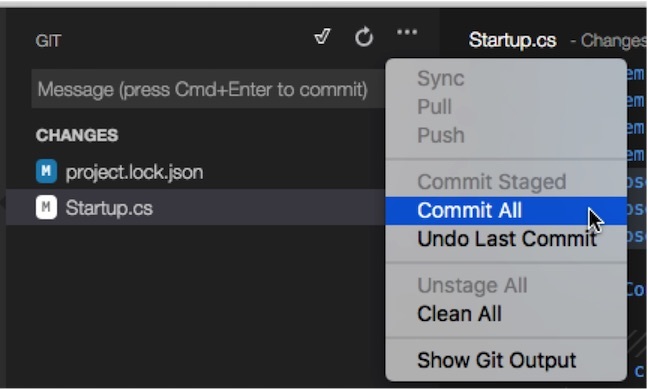 Thanks to tasks you can run any command line tool directly from Visual Studio Code and get output - including compilers, deployment tools, and packaging tools. To create a task you first need to start with a tasks.json file that can contains one or more task definitions. 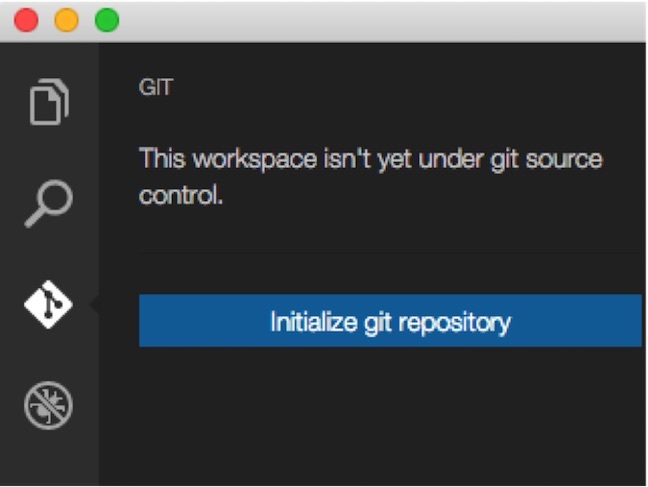 Usually it contains a task name, parameters and information related to the output; but before creating a native task for VS Code, pay special attention that if you have Gulp, Grunt or Jake tasks in your project, they will be recognized automatically. You can use all existing experiences there using well-known technologies but if you want to add your own problem matcher or execute something simple, you can use tasks.json. Debug view has all of the necessary attributes of a professional debugger. The library already contains integration with some debuggers, themes, snippets, and languages. The number of extensions is low right now, but this feature was only announced last week, and more extensions will be coming soon. 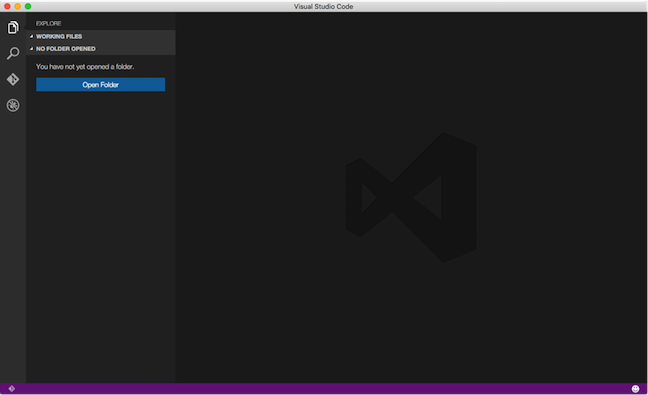 In this article we have discussed basic Visual Studio Code navigation and features. If you want to know more about integration with Unity3D, how to publish your applications to Azure, how to create Office add-ins and other topics, visit the Code documentation page, where you can find much more information.